Excellent format; a narrative supporting the paintings; text supplied by a knowledgeable range of contributors; inspiring artwork; complimenting period photographs. This is an ideal way to present the collective works of an artist. Instead of “just” a collection of prints, the reader is presented with historical information as well. This puts the subject of each painting into context and turns the book into an interesting and readable reference source. Russell Smith has won many awards over the years for his artwork. With a love of aviation and his skill for brushwork, it was inevitable that the two would be combined. His paintings are done the “traditional” way of utilizing oil paints on canvas or linen. While many enthusiasts would like to have such paintings scattered throughout their abode, cost and practicality usually prevents this. There is another way that voluminous pieces of artwork can be enjoyed. It can be collated and presented in book form which also allows it to be made available to a much larger audience. This publication however does more than that. There is a story behind the subject of each painting and it’s told by a fellow aficionado or researcher. Many of these people will be familiar to the pundit with such luminaries as Jon Guttman, Greg Van Wyngarden, Alan D. Toelle, Charles Woolley, and Colin Owers being just a sampling of the combined talent. 44 pieces of artwork are presented within the 172 pages with most being printed over a single A4 page. The diversity of techniques used by the painter ensures that the viewer is not confronted with the same style of interpretation over and over again. This is also helped by the constant variety of subject matter and the settings in which the central theme is placed. It’s not just aircraft that are the premise for these images. Many times the painter is showing us an “event” that’s captured in time. 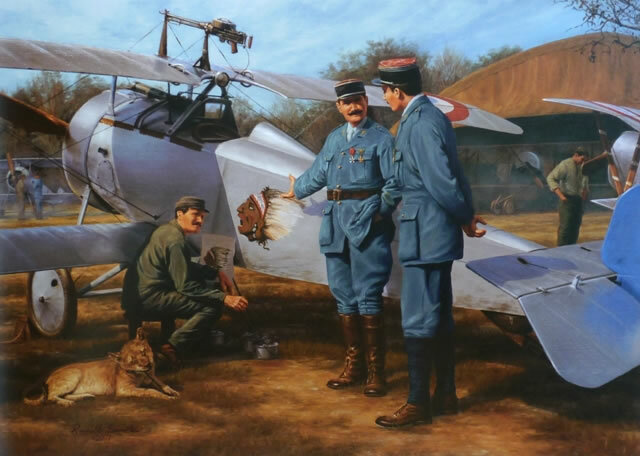 Such a painting is “Mark of Distinction” that shows the moment William Thaw presents the Indian Head design to Capitaine Thenault for approval as the squadron insignia on a Nieuport Scout. As with all the paintings in this publication, there follows an appropriate narrative to describe the occasion and background the lives of those involved. Additional period photographs support the text and of these there are over 180 black and white images. Also included are a further 50 colour pics of reproduction and museum aircraft as well as 20 of the author’s own sketches. There are two additional sections of the book that should come in for special mention. One is an interesting dissection of how the author produces his work from inception to the finished product. It is a lot more complicated that most people think. Putting brush to canvas is only part of it and this enlightening chapter gives you a better appreciation of the process. The second is Alan Toelle’s approach to aviation research in the postmodern era. In his essay he describes the studies undertaken to support the faithful reproduction of an event and how that translates into a work of art. 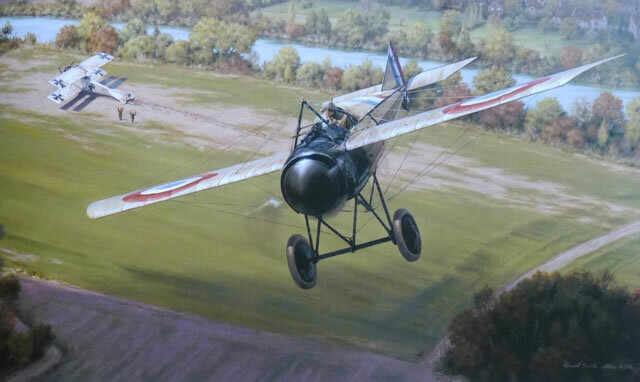 To explain this, the author looks at the camouflage and markings of some famous SPAD XIII fighters. As a result we get 4 colour profiles and some interesting revelations about the livery. The book is rounded off with a biography of the contributors. There is also a listing of the artwork and when it were painted, the latter giving an insight into how the painter’s style has developed over the years. 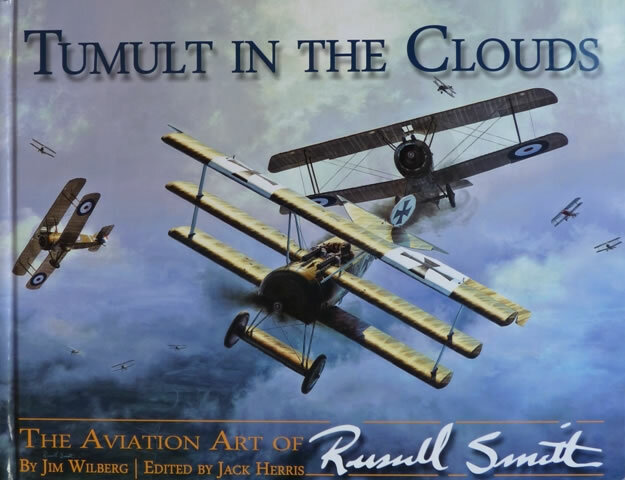 This is an excellent way to enjoy the collective works of an aviation artist. Not only is it a book that displays the author’s talent, it’s also a valuable reference source as well. The text is written by a range of knowledgeable contributors that centre on the paintings and put the artwork into context. 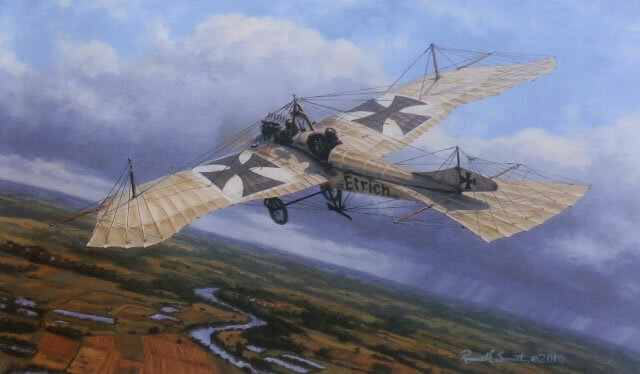 This is the first of a series that will cover a number of WWI aviation artists. If the format follows the same flight path as this publication then we are in for a real treat.